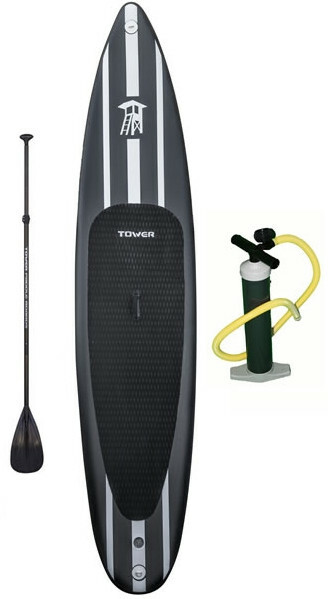 With clean, head-turning and triple-stringer 1960’s surfboard looks, the Tower, a dedicated stand up paddle boarding brand, are making some of the best inflatable standup paddle boards in the market. They are also making all sorts of products for water activities; carbon fiber and wooden SUP paddles, stand up paddle surfing gear and flat-water paddle-boarding accessories…, all to serve the customer completely and conveniently. Standup paddle boarding has experienced a booming growth worldwide thanks to what it has to offer; it’s a “triple threat” as the Tower like to call it. Standup paddle-boarding is a friendly water sport that is part surfing, part exploration, and part phenomenal core body workout. In this review, we’ll have a closer look at one of the Tower’s greatest iSUPs; the iRace. You could easily tell that this board is made to be fast, so let’s get started. The title gives it all away; the iRace is a large competitive iSUP that measures 12’6″ feet in length which is perfect for racing. Standing next to this board will definitely make anyone feel small, but standing on it is going to make you feel cool and confident for sure. The width of the iRace is standard I’d say; 30 inches which is enough for anyone to stand comfortably and balanced. It also works perfectly keeping your feet off-water. As for thickness, this board is a solid 6 inches thick making it extremely stable. The iRace is nearly impossible to bend given its thickness, as you won’t find your feet underwater even when you reach maximum weight limit (400 lbs). With Highly considered shape, finish, and significant high-end features, the iRace is one of the strongest inflatable standup paddle boards presented to us by the Tower Paddle Boards. This board is reinforced with military-grade PVC. The board’s structure is held together with thousands of vertical strands that form a strong connecting layer between the top and the bottom. When inflated at its recommended pressure,15 psi, you will feel a similar kind of rigidity that you experience on the hard boards. The Tower also provides you with 2 years warranty once you order this board; it covers everything outside of normal wear and tear. Everything said here reflects how serious the Tower Paddle Boards are about their products’ quality and services. I’d blindly recommend this board to anyone who is looking for a fast, rigid and agile iSUP. The iRace is built for speed; it’s long and narrow with a sharp nose that’s meant to make quick movements easy and fast. However, it was expected that there won’t be a storage area since any extra cargo would slow the board. A deck pad that covers half the board’s back; it’s thick, soft and very grippy and it performs what’s meant for perfectly. A rubbery central carry handle that will facilitate carrying the inflated board easily even though it’s over 12 feet long. 2 D-rings; one is on the board’s nose for toeing and the other is on the tail for safety leash attachment. A large central slide-in fin that allows smooth, straight-ahead boarding with speeds that rival other race and touring boards. It can easily be removed to pack the deflated board safely. And of course, last but not least; the beautiful classy color choice. The black and white triple-stringer from the 1960’s is very elegant it makes the board look extremely slim and sharp. It’s honestly so appealing and it’s guaranteed to turn some heads over. A 3-piece fiberglass paddle that is way better than most aluminium paddles. The iRace is true to its main mission; it’s fast and it rides straight through chopped water with minimal effort. It’s a great board for intermediate who want to upgrade their game, or professional paddlers who want a bit more speed when taking on their usual rides. It rides straight, which is good for distance, and it’s pretty versatile making it possible to be used in a lake or ocean. You can also easily use it for recreational paddling or touring since it’s decently responsive and can perform a variety of maneuvers with minimum effort. The iRace by Tower is a strong durable iSUP. It can pick up speed very quickly. I’ts 12.6 feet tall and is built specifically for speedy rides. It’s a great iSUP for both intermediate and advanced paddlers. It comes in an great package with a well-made paddle. The Tower iRace can be a bit difficult to control in choppy water especially if you’re a beginner. It has no bungee system or storage area which could be acceptable since it’s a racing board. It’s a large board, thus, the hand pump can be a struggle to use. Tip: Make sure to cover the board when it’s not being used and under the sun; the black color tends to attract more heat which might affect the board on the long run.